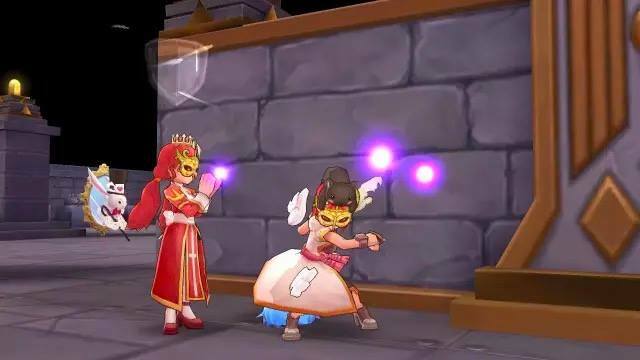 Ragnarok M: Eternal Love [Global Server] New April Events and Magic Masquerade: Exclusive Fairy Tale Headwear! The Goblin Kingdom’s annual celebrations are now starting! In order to commemorate this event, the Goblins will hold a large Spring party! 1. Find the Goblin Messenger – Tolakai, and launch the Quest “The Goblin Journey”. Each account may only use one character to finish the Quest. 2. Those missions may be activated via Fidget, in Geffen. – There are a total of 5 tasks associated with this. Each time you complete a task, you will receive [Spring Symphony] x20. – During the fifth and final mission, you may aditionally receive [Sprint Goblin Blueprints]. I. This event is limited to one character per account. Please choose your character carefully. II. Players must accept the Quests before April 8th, and they must finish them before April 15th. III. Spring Symphony] shop will only be available until May 15th. IV. The [Spring Celebration Card] will be available to enter the card Gachapon on May 15th. 1. During this event, find the ‘Great Wizard’ Yula in Geffen, and join the quest “Goblin Rescue”. – This is a single-player event. – Protect the Goblin from incoming invaders. In the event of a defeat, the quest must be started over. – You may not use ‘Fly Wings’ during this event. – Monsters in this quest can detect hidden players. During this event, Adventurers may deliver a certain amount of [Aquamarines], [Topaz], [Zircon], e [Amethyst] to the Goblin Ambassador Yowloo in Geffen, and may in exchange receive a given [Spring Symphony]. Note: This event is limited to one character per account, please choose your character carefully. The Easter Ambassador, “Mr. Robert”, has travelled all across the world and is now finally arriving in Geffen. With him, he brings ‘Easter Egg-Lucky’ for all adventurers! 1. During the event, you can find “Mr. Robert” each day in Geffen. Listen to his unique tales about Easter, and receive a [Easter Egg-Lucky]. 2. During the Easter event, all mobs have a small chance of dropping [Easter Egg-Lucky]. I. During the Easter Event, the [Easter Egg-Lucky] may be traded. II. The item is only tradable until May 15th, and you may no longer place it in the Exchange after April 26th. Event 5: “Fantasy Generator Feast” is open for a limited only, selling the “Lady Cat” series. This season’s “Fantasy Generator Feast” features the “Lady Cat Costume”, with 10 times more chances for a limited time only. Event 6: Spring Celebration Giftbox is on sale for a limited time only. During this event, the Spring Celebration Giftbox will be on sale through the Big Cat Coin store at a value of only 20BCC. This is limited to 60 items per account. There’s also the possibility of receiving the mount [Gem Duke]. Event 7: Goblin Lucky Bag on sale for a limited time only. During this event, the Goblin Lucky Bag will be on sale in the Big Cat Coin store at a value of only 12BCC. Limited to 60 purchases per account. Event 8: Yula’s Treasure Chest on sale for a limited time only. During this event, Yula’s Treasure Chest will be on sale in the Big Cat Coin store at a value of only 20BCC. Limited to 60 items per account. 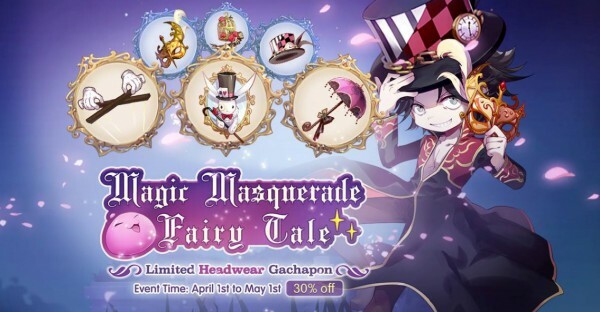 Ragnarok M – Magic Masquerade: Exclusive Fairy Tale headwear goes online TODAY! The Cheshire Cat, the Mad Hatter, the Queen of Hearts, the White Rabbit, all of them were there. Staring into the looking glass – the Alice there staring back is happy and carefree. That is, until that mirror breaks. « Ragnarok M: Eternal Love [SEA Server] New April Events and Fairy Fantasy Gacha!